NIST researchers came up with the idea for the robotic arm in 2011 as a means of meeting the demands posed by new, high-frequency antennas. The robot has now been validated and is being used to serve NIST customers. 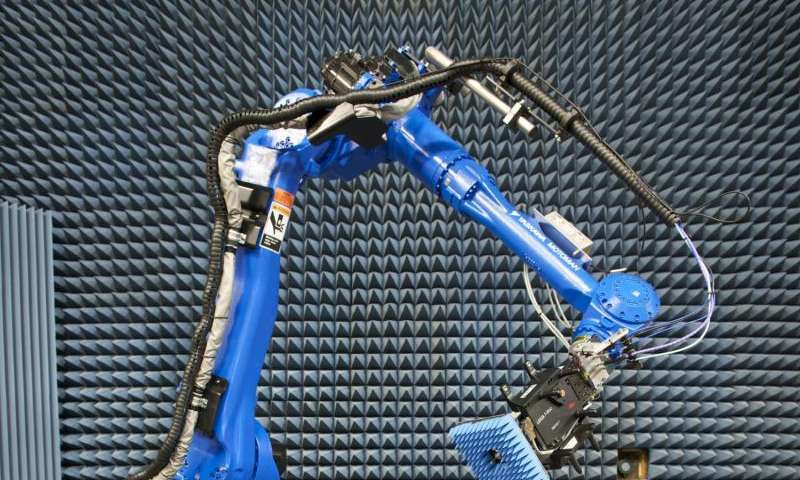 Officially introduced in a new paper, the robot's formal name is the Configurable Robotic Millimeter-Wave Antenna (CROMMA) facility. "We designed this system to address a need in the antenna community for high-precision and configurable scanning at short, millimeter wavelengths," lead researcher Joshua Gordon says. "Past systems haven't been as complete as they need to be. The robot allows us to explore many ways of doing measurements. There's a lot of configurability and an extremely high level of repeatability." Robotics is the latest advance in the widely used near-field scanning technique, pioneered by NIST in the 1970s. The method uses complex mathematical models to determine antenna properties and calculate performance at long distances—where it counts—using data collected indoors close to the antenna, where it's easier to get accurate readings. Near-field scanning allows researchers to assess an antenna's gain (signal power transmitted or received), polarization (orientation of the electromagnetic field) and pattern (angular distribution of transmitted or received energy). The six-axis robot can twist into unusual positions to measure the properties of a test antenna up to 2 meters (6.6 feet) in diameter positioned on a hexapod stage. A laser tracker monitors and records positions used for fine correction of robot postures to ensure the necessary precision. It's like a high-tech form of the game Twister. Antennas can be dynamically positioned with a precision of tens of micrometers in all six degrees of freedom—up or down, left or right, forward or back, tilting, turning and rolling. The arm can hold up to 35 kilograms (70 pounds) and can measure antenna properties in almost any user-definable pattern, including the three popular paths: spherical, planar and cylindrical. No longer is a separate antenna measurement setup needed for each path type. At first, the robot will measure frequencies from 100 gigahertz (GHz) to 300 GHz with the goal of eventually reaching 500 GHz and higher. High frequencies—with very short wavelengths of radiation—are used in many current and emerging applications due to improved spatial resolution, smaller antenna components and higher data rates. There is a particular need for accurate antenna pattern measurements above 100 GHz, a range that holds promise for future generations of advanced communications antennas and improved weather and climate prediction. NIST calibrates antennas for a variety of industrial and military customers, offers a bi-annual course to transfer near-field technology to industry and other users, and also helps other organizations establish their own antenna measurement facilities. NIST's robotic antenna measurement technology is being transferred to industry.